Unlike the kid’s event I showed you yesterday, the Grease Pole Climb event is for adults and features a 30 foot (9 meters) tall pole. Like the kid’s event, the pole is covered in grease with two minutes to complete the task. Teams of 5 people competing in a men’s and women’s division for prizes totaling $1,000US. Plus, if a team reaches the top, there is a bonus of $200 in cash attached to the pole. Each team gets two attempts. 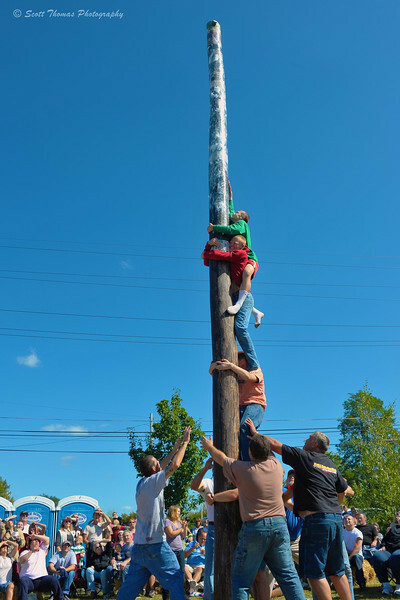 A team competes in the Adult Grease Pole Climb at the Jordan Fall Festival in Jordan, New York. Nikon D700/24-85G, 1/400s, f/10, ISO 200, EV 0, 28mm focal length, polarizer filter. In the past, I have seen teams get to the top but not this year. The winning teams got to the 21 and 22 foot marks with the women’s team having the higher mark. The cash at the top is safe for another year and will be increased to $300. Anyone want to join me next year to take a shot at reaching the top? This entry was posted in People and tagged 24-85mm, adult, climb, competition, fall festival, grease pole, jordan, new york, nikon D700. Bookmark the permalink. I’ll meet you there next year and I’ll bring my cleats ! Ha! I was one of those kids who could barely climb the ropes in gym class, so I think a greased pole would be way beyond my capabilities!